The next possible ocean passage is a few days away so we continue in the ICW. It’s a nice break after being out. 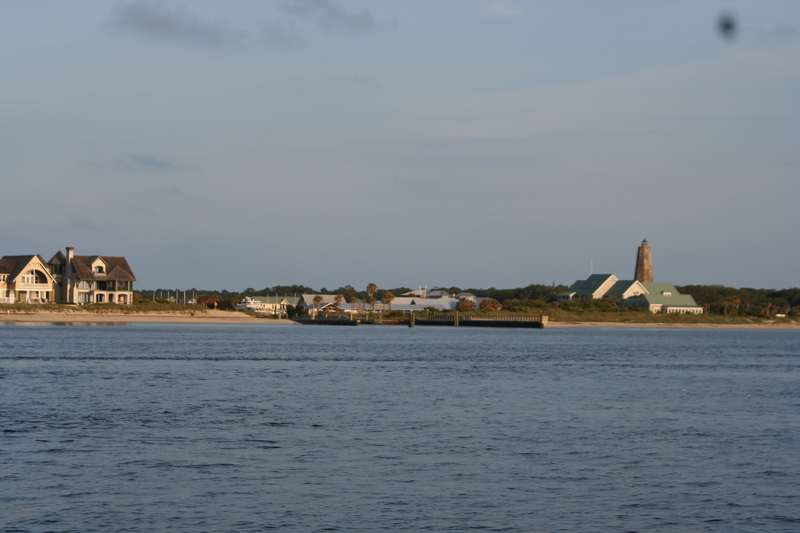 We stay in Georgetown, SC for a day (5/28) and visit our old haunts and then arrive in Myrtle Beach, NC (5/29). A pool and a pond with at least 60 turtles keep the boys amused for the afternoon. 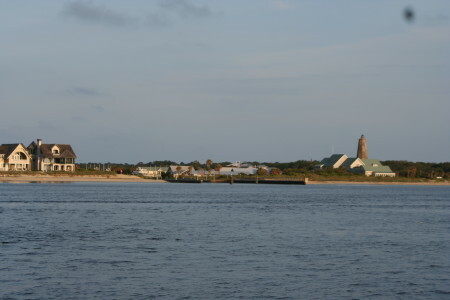 From there, we head to Bald Head Island. We end up docking next to “Journey,” another Lord Nelson. Only 52 of them were built in the 80’s and it is the first one we’ve seen, other than our own. 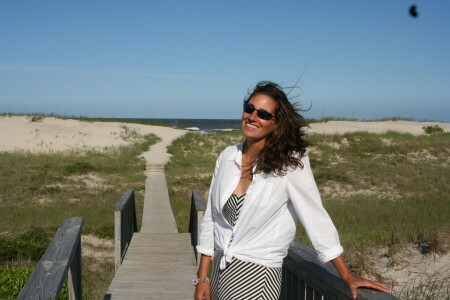 If you are looking for a place to vacation, Bald Head Island is gorgeous. It’s impossible not to slow down here. No cars are allowed, only golf carts, so stepping out of a 70-mile-per-hour life is easier. We rented bikes and kayaks, had a picnic on the sand, walked to the tip of Cape Fear, climbed the lighthouse, went swimming and took walks along the beach (seeing at least six skates in just a few feet of water). 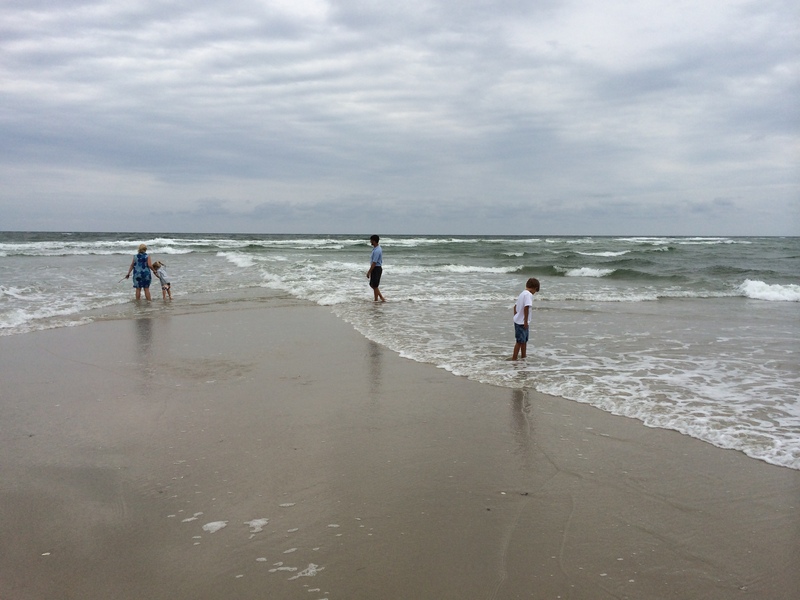 [Matt & Joshua at the tip of Cape Fear, one of NC’s three great capes, known collectively as “The Graveyard of the Atlantic” for the numerous vessels which have sunk upon the shoals. Comforting]. We decide to stay through the weekend. Matt and I have been together 14 years, twelve of them as husband and wife. Sunday (6/1) is our anniversary. Matt asks what I want to do to celebrate. I shrug, “I don’t care.” I tend to go over the top so Matt looks at me and says, “You bought gifts, didn’t you?” “I did nothing,” I say. We both agree we’re tired and that it’s fine. After church that morning, we walk to the post office and see babysitting ads on the wall. After three tries, we find someone who can watch the boys from 4-8 pm. To mark the significance of the occasion we shower but still don’t have clear plans. Matt surprises me with a few gifts. He subscribes to the ‘it’s a verb, not a feeling’ theory of love. I confess to occasionally subscribing to the ‘what have you done for me lately?’ theory of love. The Red Cross-certified babysitter arrives and takes the boys to the pool. We are now back to ‘the original two’ as Matt calls us. Our life is divided into B.C. (before children) and A.C. (after children) segments. Matt rents a golf cart. We tour the island and go to a turtle/alligator hangout and walk on the beach. We have friends who are sailing by on their way up to NYC. 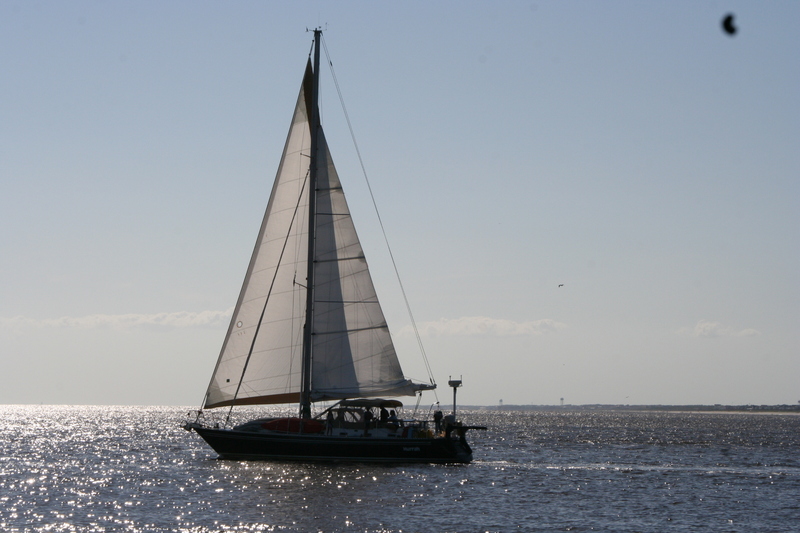 It’s rare to have photos of one’s boat in sailing mode so we want to get some for them. Greg calls and says they are passing by within 30 minutes so we race to the other side of the island. 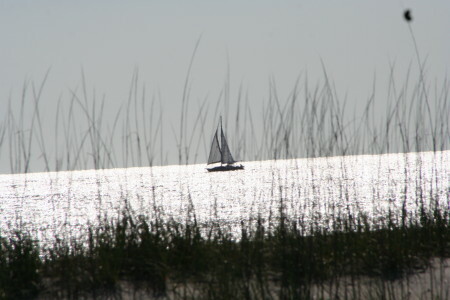 We walk on the beach and take lots of photos of their boat as it passes by Cape Fear. “Would you still marry me, knowing everything?” Matt asks me over dinner. I think for a bit. “Yes,” I tell him, “I would.” We talk about the trip. Maybe everyone sometimes has a need to break out. In the BHI lighthouse museum, we read about a successful European plantation owner living in Barbados in the 1800s. In the middle of the night, he left his wife and children and took off in a fully loaded boat to become a pirate. He was just as successful in his new venture, although it didn’t end well [a hanging]. I wonder if he was having a midlife crisis. Next year Matt and I will be halfway to 90 – this trip is as good a way as any to mark a significant halfway point. This entry was posted in Uncategorized on June 8, 2014 by Diane.